Jing Li is a third grader (07-08) born in 1997. Her father died of car accident three years ago, and her mom left. She now lives with her aging grandma and depends on her father's sisiter's support for living (her grandgrandma died recently). She is generously sponsored by Eric Fang and Yao Zheng. Hui Sun is a 4th grader (07-08) born in 1998. Her father died of accident 3 years ago. She lives sometimes with her aging and sick grandparents and sometimes lives with her grandma on mother's side, her mother's older brother who has problem due to Childhood disease (not married), and her mother. Her grandma in her mother's side buys and sells vegetables and other small things to support the family. Unfortunately her mother is not a responsible person to say the least. She likes music and Chinese. 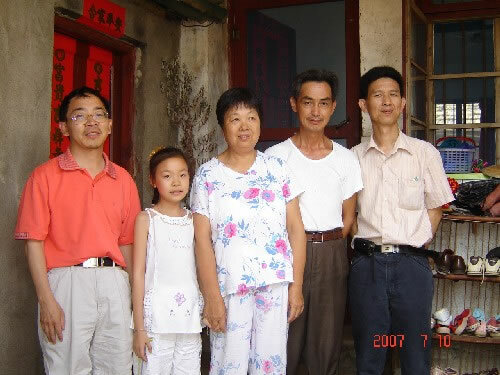 In the photo are her grandparents in her father's side. She is sponsored by Nanjing Group. Yimin Mao is a 2nd grader (07-08) born in 2000. She lives with her parents, and grandparents in her mother's side. Her grandparents in her father's side used to live with her too. But her father's father died recently and her father's mother ives now with her father's brother. Her mother's mother is mentally ill. Both her parents are hard working and her family's situation should get better in a couple of year (they moved from a village to suburb several years ago). She is very smart and hard working and is outstanding in school. 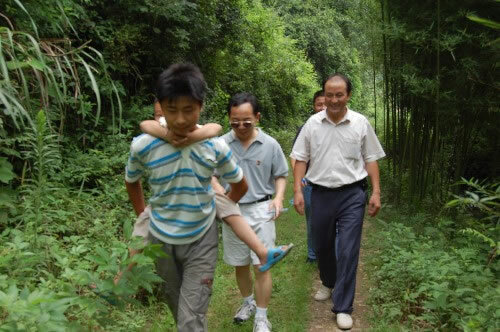 Tingting Li is a 3rd grader (07-08) born in 1998. She lives with her parents and her little brother of almost 2 years old. They moved from another region in Anhui. They rent a house for living. She is excellent all around and in particular in sports. Her father was awarded as `best parent' by the school and looks smart and hard working Her family situation should get better in a couple of year. Yan Li-Min's sponsors Professors Jian-Shu Li and Ren-Lan Liao will continue to support her through college via the Hometown Education Foundation. Mr. and Mrs. Adem, sponsor of Miss Fan Lin-Min gave her another $150 to help her starting her college life. Mr. Yan Wei-Bing, the owner and CEO of a small local business (selling solar water system), has a unique way to support us. He puts a donation box in his business place. 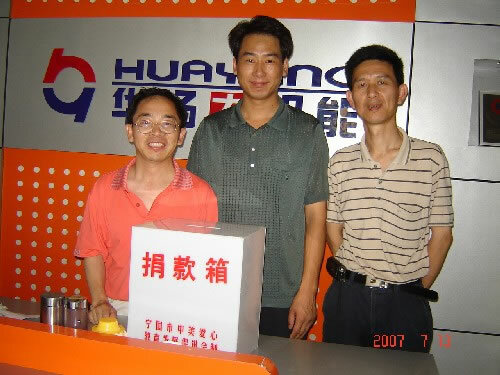 Everytime a person donates 10 yuan or more, he is given a discount card worth of 50-100 yuans for buying his products. On the discount card, there is more information about the charity. This will let more people know about our charity and encourage more people to support us and help the poor. Mr. Yan lost his father early and had to quit school when he was in 7th grade to find odd jobs to support himself and his family. Xu Yin-Yin is a 9th grader, soon be to be a high schooler. Her mother died when she was very young . She lives with her father who has Parkinson's disease and does odd jobs to support the family. Her house is totally broken. She is always the last one to register in school. Michelle Yang was interviewing her. 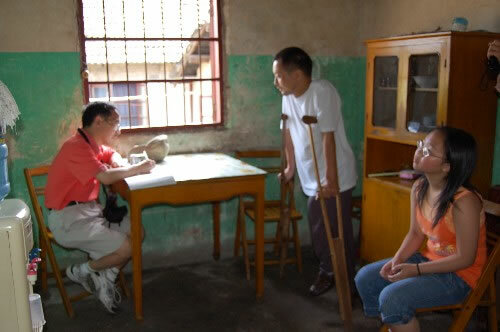 Miss Hu Mei-Xian lives with her sick mother, a handicapped brother, and another brother. Her healthy brother quitted school at 7th grade to find odd jobs in cities to support the family. Her father died when she was four. Her mother's body was swollen due to some disease. Her handicapped brother has not hands and can not work. She is in 7th grade during 06-07 and likes music in school. Her house is old and broken. Zhang Jin is a 4th grader born in 1996. She is an excellent student and likes to read and study at home. 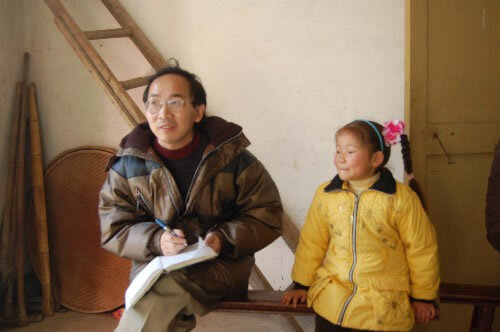 Her father died of kidney failure two years ago, and her mother became mentally unstable and left soon after her father's dealth. 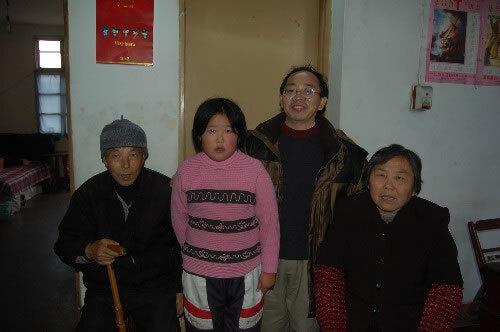 She lives with her grandparents and depends on her grandfather's little pension for living. The house was given to them by a neighbor who left the place. She has been generously sponsored by Ms. Zhou Wei. Wu Yang is a 6th grader born in 1994 and will be a middle schooler starting this Fall. She likes music. Her mother died of disease 5 years ago with a lot of debt. She lives with her father, grandma, her older sister. Her sister is now in college (graduate next year). All depends on his father's hard work at a local factory. Her grandma seems quite able although old since the house is very clean. Cheng Feng (not in the photo, she is not at home that day) is a 8th grader during 06-07. She bikes to school and has lunch at school. Her father is handicapped (see photo). Both her parents made a living by making clothes for others. Unfortunally, nowadays there is no business since people are buying clothes. They depend on monthly 180 yuans (about $22) subsidy from the government. But they have big hearts. When the sponsored $80 by Mr. and Mrs. Bixby is more than the school fee, her father told her to give the extra to other poor kids. Zhao Tianci is a 6th grader born in 1994. He lives with his father and his half sister. He is really unlucky. His own mother died when he was very young. Soon after his father's remarriage, his step mother had cancer and eventually died of the cancer last year. His half sister quitted school after elementary school after his step mother ot sick. His father had to stay home to take care of him and found jobs. His father will try to find odd jobs in the city when he goes to middle school this Fall. They still have a lot of debt. Yan Jun is a third grader born in 1998. He had a happy family until about 2 years ago when his father fell down from a house and fatally injured. His father never recovered and died about 2 months ago. It has been really tough both financially and mentally to his mother and family. He is a very good kid. He likes Chinese and likes to read in his spare time. He helps his mother do some chores, e.g., washing dishes and clean floor. He is supported by `Nanjing Group'. Wan Feng-Long is a 7th grader born in 1991. He was out of school for a year during his elementary school years. His father died when he was three, and his mother left is is poor herself. He is supported by his older uncle and his aging grandpa. His uncle does odd jobs in Beijing to support him (very hard since his uncle is illeterate) . He led us to his home. On his back is his 5 years old cousin. 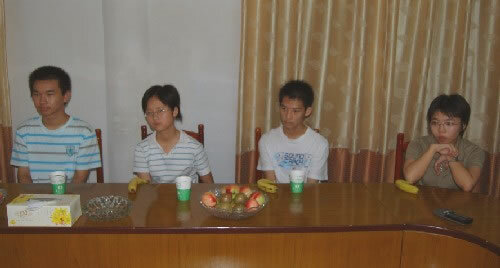 Cheng Wei-Yong is a 7th grader and has a very nice house in a village. He lives with his parents and an older sister. His father is a smart and hard working farmer who raised also two of his late brother's sons to adult. Unfortunately, his father was found to have liver disease and diabetes. His father can not work hard and has to take medicine everyday, which makes his family very poor now. His sister graduated in high school this year and hopes to get into a professional college. He is excellent in school, and is number in his class and top three in his grade (of 106 students). He likes to ask questions in class. He is supported by `Nanjing Group'. Cao Yuan-Hui is a 6th grader born in 1994. His mother died in 2001 with debt. 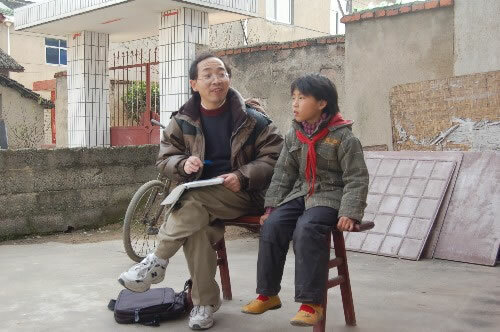 His father went to Ningguo City to do odd jobs to support him and his grandma of over 80. He likes math. He is supported by a local company.